let you add new features and functions to your browser. Some provide one-click access to some of your favorite web applications like eBay and digg, or news and information sources such as NPR and Time.com. Others are useful tweaks for performing common online tasks such as browsing photos, getting directions or shopping. We previously launched extensions on the beta channel, and many new extensions have since been contributed by developers from all over the world. Now you can browse over 1,500 in our extensions gallery and install them on the stable version of Google Chrome. Bookmark sync is a handy feature for those of you who use several computers — say, a laptop at work and a desktop at home. You can enable bookmark sync to synchronize your bookmarks on all of your computers so that when you create a bookmark on one computer, it's automatically added across all your computers. This means that you won't need to manually recreate the bookmark each time you switch computers. 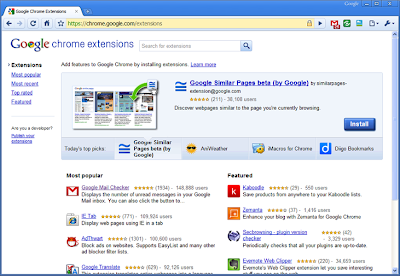 Extensions let you add new features and functions to your browser. Some provide one-click access to some of your favorite web applications like eBay and digg, or news and information sources such as NPR and Time.com. Others are useful tweaks for performing common online tasks such as browsing photos, getting directions or shopping.